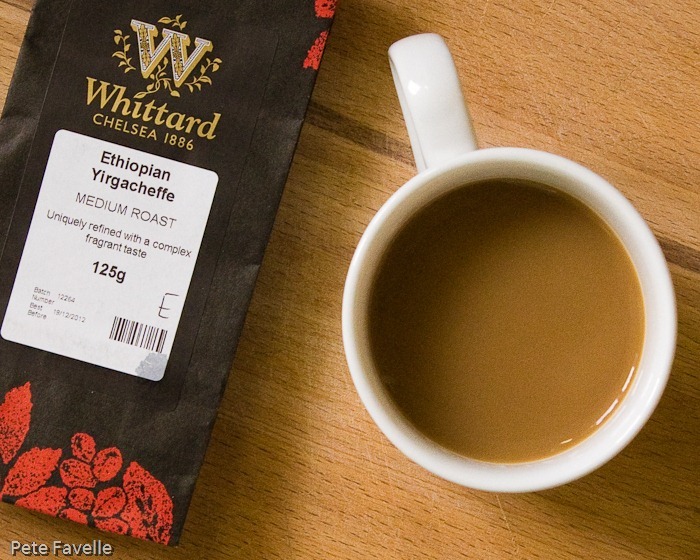 I love how educational this blog can sometimes be; until this morning I had no idea that there was a town in Ethiopia called Yirgacheffe (also spelled Irgachefe) and now I know that it’s an important coffee producing centre, thanks to Whittard! 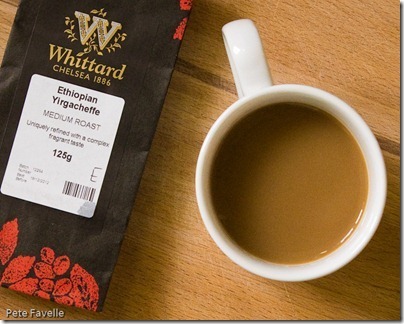 This is their Ethiopian Yirgacheffe, a medium roasted coffee with a mid-brown colour to it. The grounds smell of dark bitter chocolate, with a hint of floral summer fruit underneath. Brewed, the aroma is richer with a surprisingly deep roast to it along with more hints of light raspberry fruit. The taste, too, is definitely richer than strength 3 may suggest; warm, medium bodied with a distinctly fruity character and a tannic finish strangely reminiscent of good cup of tea! Unusual but pleasant and easy-drinking, this earns 2 and a half stars.